What? Millions of scientists? Consensus of top experts? Where have you got these numbers from? I could not count more than ONE scientist. After the pressure from the venerable Stephen McIntyre, IPCC posted on its web the "comments" from the Reviewers of AR4 2007. And the comment from the representatives of the Norwegian government on Chapter II, Working Group I (solar forcing) are very striking in the context of solar forcing. "I urge IPCC to consider having only one solar physicist on the lead author team of such an important chapter. In particular since the conclusion of this section hangs on one single paper in which Judith Lean is the co-author." As I wrote elsewhere (Czech article ACRIM vs PMOD), Judith Lean and Claus Fröhlich are responsible for scandalous rewriting of the solar activity graphs. The original satellite data showed, that TSI (measured in Watts) increased from 1986 to 1996 by cca one third... But then Judith and Clause "laundered" the graphs and voila... solar output increase was gone. The people, who were in charge of the satellites and who created the original graphs (the best world astro-physicists: Doug Hoyt, Richard C.Willson) protested against this manipulation. In vain. R.C. Willson (head of the ACRIM satellites): "Fröhlich made unauthorised and incorrect adjustments... He did it without any detailed knowledge of the ACRIM1 instrument or on-orbit performance...The only obvious purpose was to devise a TSI composite, that agreed with the predictions of Lean's TSI proxy model." Douglas Hoyt (the famous inventor of GSN - Group Sunspot Number indicator) agrees with Willson. The graph tampering done by Judith and Claus was scientifically unjustified. Hoyt must know that. The questionable changes were done to the data from the Nimbus 7 satellite, where he used to be in charge. I hope Batman ... I mean the mysterious hacker FOIA, hacks Judith's computer asap. I expect he finds an e-mail like "I have just used the trick... to hide the increase of solar activity." And guess what? Suddenly this very Judith is appointed as the highest authority and ultimate judge in the question of solar activity non-increase. Since when is it customary to appoint the main suspect as the chief investigator in her very own case? BTW it is a flagrant violation of the rules of detective stories (R.Knox. "Rules of Detective Stories Writing", 1929, rule seven). IPCC assessed the solar activity development without asking the solar physics or astronomers. And they plan doing this in the Fifth Report (AR5, 2010-2015) again. In June 2010 they published (here) the names of the staff for the next IPCC report and - if I counted correctly - the solar chapter has only one solar physicist again (Blanca Mendoza, a sample study of hers here). The boss of this chapter is to be Mr.Shindell from GISS, a colleague of the climate madman Jim Hansen, who endorsed Keith Farnish's book promoting eco-terrorism last year. Groovy. There are almost no solar people, but on the other hand, there are shitloads of guys, whose job is to rake in the absurd climate models. Which is useless, since we do not know all the climate feedbacks yet. So there is nothing to model. Since they did not bother to ask the astro physicists, IPCC is kept in dark about the Sun. IPCC reports have some 3000 pages, but the most important segments - about Sun - are just a few short and vague articles. But there is an explanation. These indicators say, what the alarmists do not want to hear. They say, that in 1970s-1990s the solar activity was rising and that global warming (whole or most of it) can be attributed to natural climate forcings. No reason to blame humans. IPCC probably vanished these graphs on purpose. Following the well known rule-of-the-thumb "hide the decline" (in this case more like "hide the rise"). Because it could give the laics a "misleading signal" and "dilute the message" about global warming (yes, this is really the logic of IPCC: read here about the Arusha meeting). And having some nosy astronomers around - who would just talk back - would not help at all. We have experienced, that the shorter the cycle, the higher the activity. Just try and compare it with the geomagnetism graph. See? They match. This is how Phil Jones (CRU) described the development of global temperature in 1986. Quoted from the famous Christensen 1991 study. See here and here (Czech). The original satellite measurements of solar activity (TSI) in red. The ACRIM composite. Judith and Claus flattened the graph (blue, PMOD). Alarmists were pleased and rewarded her with a job in IPCC. The Climate System. Web Columbia University. Graf 12. 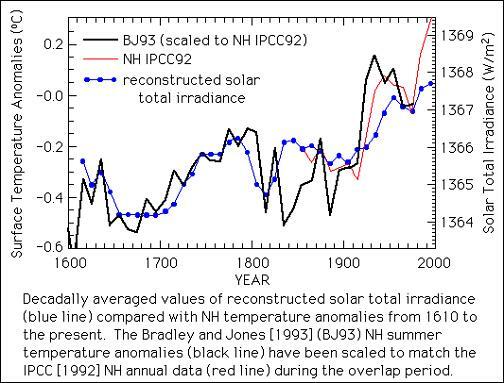 As you can see, temperatures have always followed the solar activity. Though never precisely. 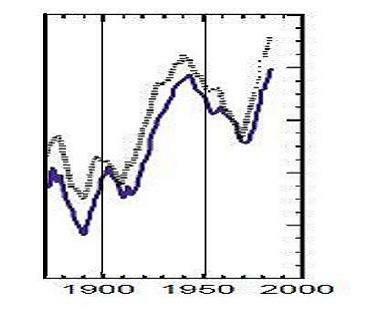 If IPCC placed these graphs in its solar chapter, every reader would see at the first glance, that the global warming 1975-1998 was -very likely - natural, not manmade. But in that case, the alarmist movement -and IPCC itself - would lose its raison d'etre. The IPCC "hoaxes" about Himalayas melting in 2035 or about not-rising-solar-activity (in 1970s-1990s) are spreading like a virus. Through citations. Scientists from all the world quoted this rubbish - without verifying it - in good faith , that it is a reliable peer-reviewed science. It is not. 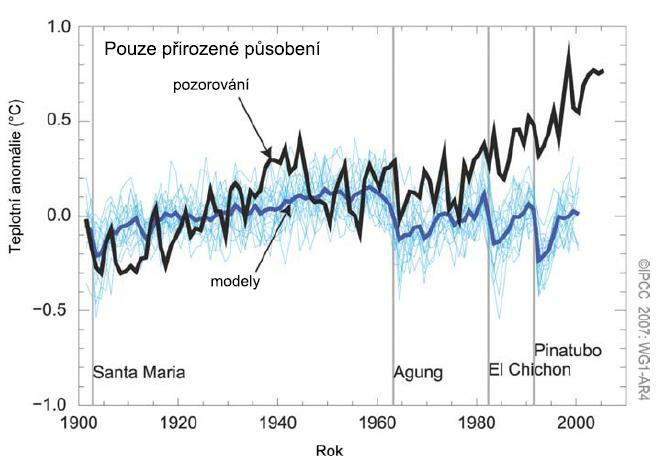 Also the latest publication by Czech climatologists-meteorologists Metelka and Tolasz relies heavily on the IPCC pulp fiction. The book has a self-contradicting title "Climate change - facts without myths" (Klimatické změny - fakta bez mýtů, 2009). 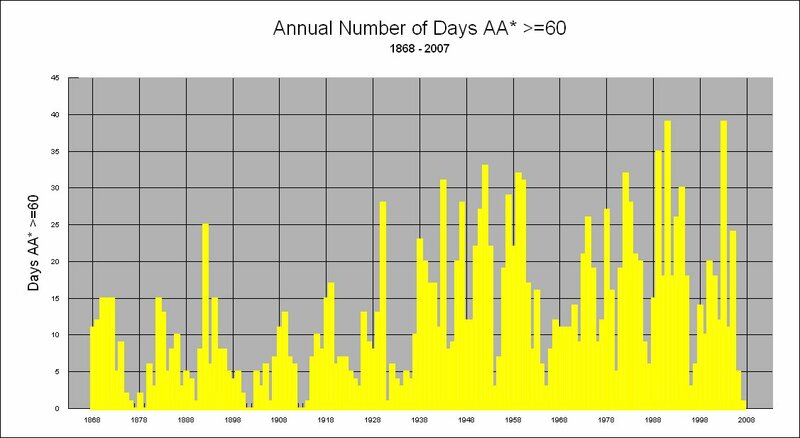 It says solar activity was flat over the last half century. Wow. Czech climatologists should sue IPCC. Because this damages their professional credit. Can the temperatures (black) be explained by natural forcing (blue)? 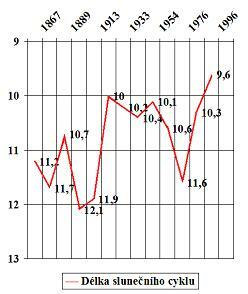 In their latest book the Czech climythologists quoted this junk IPCC graph (page 24). 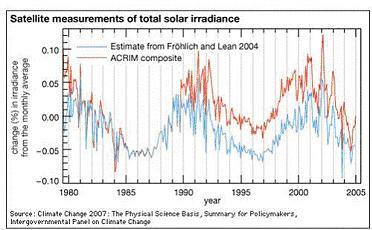 The trouble is, that the AOGCM models do not include the solar activity factor, which was rising in 1970s-1990s. Judith erased this increase. Human activity is to blame indeed. Hers. b) Then the equations will not match. Something is missing. c) You accuse humans as the probable cause of this mismatch. Or ghosts, UFOs or God. Anyone, who you want to put the blame on. d) Now you ask the framed people to pay their "climate debt". To your pocket of course. The far-fetched conclusions of IPCC about the impact of mankind on climate - and the gigantic soviet-style plans to reshape the whole energetics to cut the carbon footprint... hangs on a single question. How big the solar activity was. Yet IPCC devoted minimum attention to this issue (only few articles). 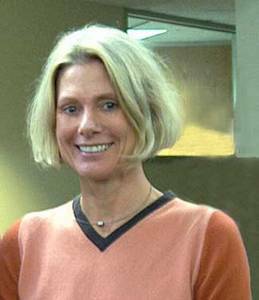 And it based everything on a "consensus" of a single astronomer, who agreed with herself. Ceterum autem censeo IPCC esse delendam.